George Clooney was born on May 6, 1961 at 02:58 AM EST in Lexington, Kentucky (38 N 03 /84 W 30) (source: AstroDatabank, Rodden Rating AA). Not to overwhelm you with information, we will only assess the horoscope of George Clooney by looking at the factors that only have some meaning for his love life. 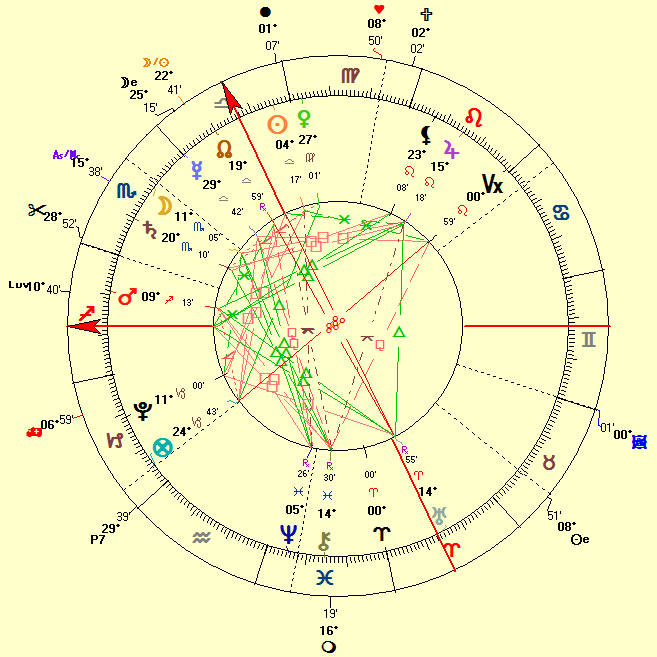 there is a powerful Mars-Pluto connection (the ruler of the 1st house, mundane ruled by Mars, is in the 8th house AND the ruler of the 8th house, mundane ruled by Pluto, is in the 1st house, mundane ruled by Mars). In other words, the rulers of the 1st and 8th house are in mutual reception. 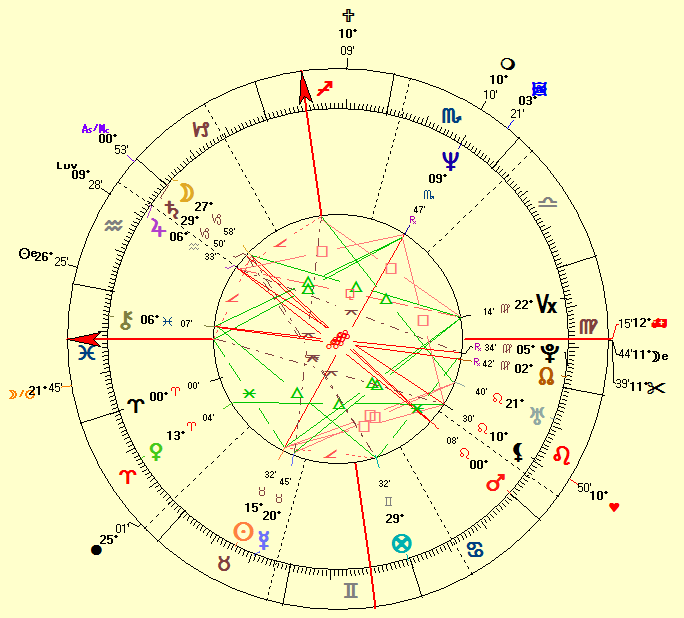 The exact Mars-Saturn opposition at a 'critical degree' marks his natal chart profoundly. Opposition aspects often manifest in relationships because oppositions represent the polarization between the Self and The Other. All oppositions between Saturn and another body or planet represent blockages, walls, fences that create a distance. This is a very defensive aspect indeed. This aspect may show some issues learning from one's own mistakes over and again. Because Mars is at 0° Leo, a so-called 'critical degree', chaotic living circumstances and possible break-ups and divorces are pre-programmed in his life. Saturn at a 'critical degree' as well (at 29° Capricorn) very strong and powerful in its own sign overpowers the influence of Mars. Saturn here suggests the ability to live in very opposing and contradictory situations. It's likely George Clooney is extremely ambitious and needs tons of high-standard projects to feel satisfied. In other words, he easily feels dissatisfied. 29° Capricorn can be a very stressful and disruptive degree also, reinforcing possible break-ups or divorces in his life. Invariably, predominant Sun-Venus connections indicate a beautiful (Venus) body (Sun). On the other hand, the ﻿powerful Neptune-Pluto connection﻿ suggests that George Clooney dislikes being pinned down. This connection is a very sure indication that he does not bond easily and prefers (even urges) to be free. There are escape mechanisms at work here that even prevent him from feeling pinned down. The Mars-Pluto connection and the mutual reception between the 1st and 8th house indicate the need to master fear and situations of panic. The low air count in his natal chart reveals a very creative nature. The downside is some difficulty being objective and growing confusion as he grows older (a cluttered mind instead of a clear mind)..
George Clooney got married on September 27, 2014 between 13:26 and 13:40 in Venice, Italy to Amal Alamuddin. Reportedly, the couple went inside the Venice city hall around 13:26 and left the city hall as husband and wife around 13:40 -- making for a very short ceremony that only lasted just 14 minutes. George Clooney was previously married to Talia Balsam from December 15, 1989 till September 17, 1993. So, it's his second marriage. Let's take a closer look at this 2014 marriage horoscope now, calculated for 13:35, the time in-between entering and leaving the city hall. And again, we will only look at what stands out on that very moment. In this marriage horoscope we find Jupiter at a critical degree. In this position, Jupiter represents a happy turn of events. Mercury at 29° Libra, an ending degree, indicates a profound change in relationships. One is compelled to enter or change a relationship. Uranus conjunct the 4th house cusp denotes a very freedom-loving relationship. In this position, Uranus cannot sit still and needs a thrill, needs to go out because it feels fenced in easily. Update June 6, 2017: George and Amal Clooney welcome twins, Alexanderand Ella, born today June 6 some time in the morning somewhere in England. Update February 9, 2017: On the CBS morning show "The Talk", Julie Chen confirmed that George Clooney and his wife Amal are due with twins in June. A family friend of the couple also confirmed the news to the AFP on Wednesday February 8, 2017, saying, "She's pregnant with twins." George Clooney is to become first-time father then.